The International Anti-Poaching Foundation (IAPF) and the Nakavango Conservation Program are pleased to introduce a couple of new additions to the resident rhino population at Victoria Falls. A small female calf was born around the 1st of July this year, and has literally hit the ground running. 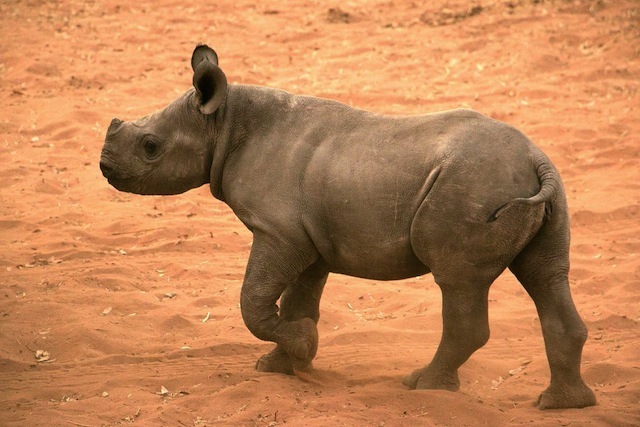 She has developed a fast, feisty nature and is already trying to secure herself as one of the most charismatic rhino we have ever come across. Named “Misinzo”, the rangers have given here this moniker as a tribute to all the rhino & people of Zimbabwe. In the local Tonga language, “Misinzo” roughly translates to “a good omen/feeling at the beginning of a long journey” AND “a good omen/feeling at the end of a long journey”. Our rangers feel that her birth, which came as a bit of a surprise, marks a progressive future for rhino and humankind and although we still have a long way to go, she will help carry the torch into this future. In September, there was another addition to the clan with a young male being born. This little guy is very inquisitive and lacks an ounce of shyness in his disposition. The team is certain that this guy will grow up to be a very big and dominant male. The rangers continue to monitor all of these animals day and night and will stop at nothing to ensure their protection. As they learn more about this young male, the time will come to sit down, discuss his character and come up with an appropriate name.